Have fun in the waves! Located on the National Seashore, this charming, two story, year round Cape is across the street from Wellfleet ocean beaches and offers great views and ocean breezes. The first floor includes a fully equipped kitchen, full bathroom, dining room that seats six, a living room with fireplace, bedroom, and screened in porch perfect for breezy summer evenings. The second floor has two bedrooms with queen sized beds, a full bath, and a wonderful deck that's a great place for private sun bathing. The outdoor shower is perfect after a long day at the beach. Our home is across the street from beautiful LaCounts Hollow beach and just down the road from the Beachcomber for dinner, dancing and a pig roast. For those who want warm waters, the ponds are a short drive down the road. Perfect for non-motorized water sports. A beautiful spot for nature walks and bird watching too. The bike path is just at the end of the road and bike rentals are available. Wellfleet offers wonderful art galleries, great shopping, delicious restaurants, and the perfect bay view lobster shack for fried clams and ice cream. Go to the drive-in movies or enjoy a fun day at the flea market just down the road. 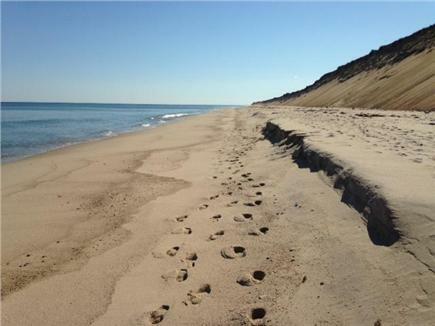 Take a ride into Provincetown for a great day of whale watching, shopping and site seeing. Additional pricing info: Multiple weeks discount and off season 3 night minimum available, State and local taxes of 12.45% will apply. This home was well equipped with an excellent location. The upper deck had such wonderful views of the sunrise, the ocean and the stars at night. The screened in porch was perfect for sitting in the morning enjoying coffee. The walk to the beautiful ocean beach (Cahoon Hollow) was just minutes. Emily is wonderful to work with and makes the rental process easy. Looking forward to another long weekend here! !